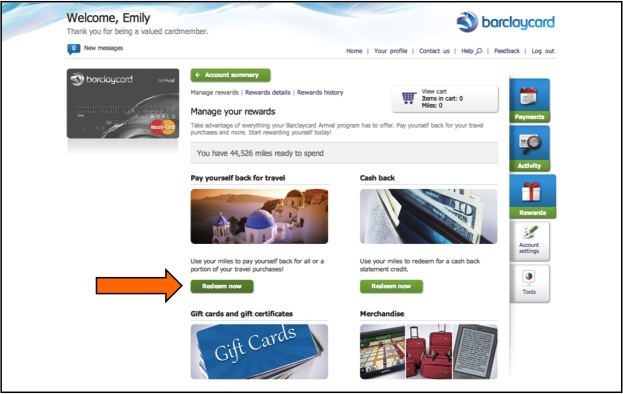 Last week we redeemed the sign-up bonus on my Barclaycard Arrival™ World MasterCard® – Earn 2x on All Purchases for $425 toward a flight we had recently bought to California. The whole time I’ve been learning about and using this card I kept asking myself “Is it really that easy? Where’s the catch?” This post is my report from the other side of the redemption process and let me tell you, it really is easy and there is no catch! A commenter asked a question on my last post about this card about what kinds of spending count toward the minimum spend. It’s everything that you can put on the card! On our two World Arrival cards, we charged: groceries, eating out, purchases from Target, Home Depot, Amazon, New Egg, and GoDaddy, car insurance, a donation, a purchase through our church, a dental checkup, our home internet, Kyle’s cell phone, movies in theaters, gas, a haircut, our water, car repairs, a DMV registration fee… Basically everything but the kitchen sink (but a kitchen sink would have done the trick as well)! All of those purchases counted toward the minimum spend because on both our cards we received the sign-up bonus right when we hit $1,000 in spending. So do not worry about any types of purchases being excluded from going toward the minimum. Since we didn’t charge any travel purchases during the $1,000 minimum spend, we had to wait to put another travel purchase on my card so we could redeem the sign-up bonus at the best conversion ratio of miles to dollars. If you redeem for travel, you convert at 1 mile = $0.01, but if you get cash back it’s 2 miles = $0.01. The best thing about this card IMO is that it’s a hybrid of a travel rewards card and a cash back card. You get the high bonus usually associated with a travel rewards card but the ease of booking and redemption of a cash back card. It’s also really straightforward to know where your rewards balance stands. When we were ready to book some travel – a flight to CA for a wedding in February – we just went through our normal booking process of comparing flights on kayak.com and a few individual airline websites. We booked our travel using my Barclaycard World Arrival MasterCard as we have every other time with no consideration for what the card wanted or having to visit its website or anything. We were pretty nervous to do the miles redemption correctly because we didn’t want to screw it up somehow and lose that amazing $400 sign-up bonus! That’s why I’ll walk you through how to redeem the miles. It really is simple but the unknown made us nervous, but you’ll see it would be very difficult to make a mistake in this redemption process. 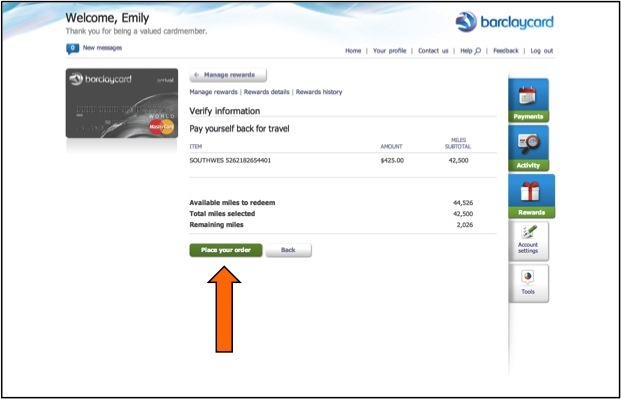 When the flight charge went through for $746, we went to the Barclaycard World Arrival MasterCard website and navigated to the ‘rewards’ tab. It showed us the current balance of “miles” on our account (40,000 from the sign-up bonus and 4,526 from rewards on spending). We clicked on “Redeem Now” to pay ourselves back for travel. 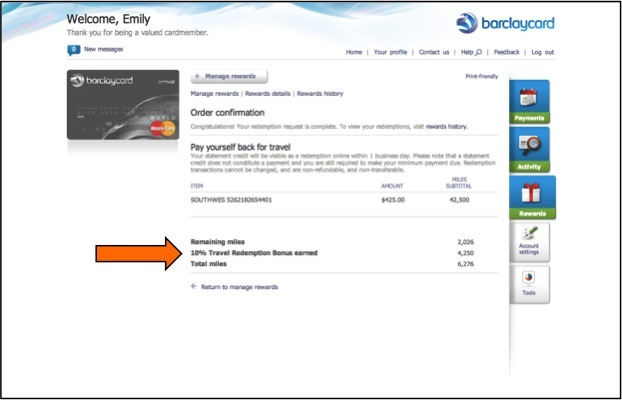 The next screen showed us the purchases that the Barclaycard World Arrival MasterCard had identified as eligible for redemption – our flight, as we expected. It showed us the redemption ratio available for the purchase, 1 mile = $0.01. 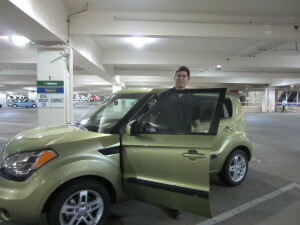 It also showed us how many days we had left to apply miles to this purchase, which was nice. When you apply your miles, they will be added at that 1 mile = $0.01 ratio for any travel you have within the past 90 days, so that little counter of days remaining helps you keep track of that window. We clicked ‘Redeem Now’ and chose the number of miles (multiples of 2,500) that we wanted to apply to this purchase (we chose the max available – 42,500). You go through a few confirmation screens to place the order so there’s no chance of not knowing what you’re doing when you’re redeeming the miles! This page showed us how many miles we had, how many we were using, and how many would remain. The miles were applied to our statement within just a couple days, knocking our amount due from $746 down to $321 – that feels good! 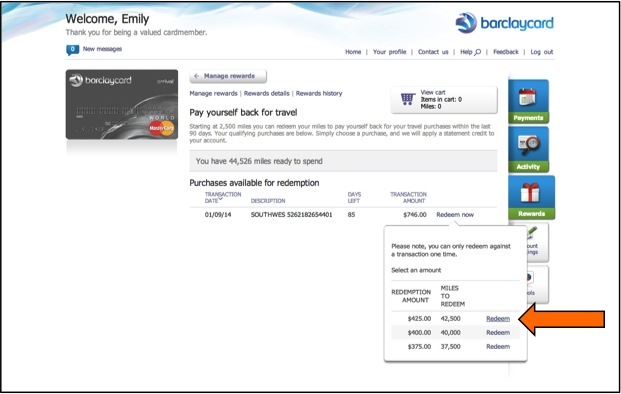 You can see one of the perks of this card on the confirmation screen – the 10% bonus when you redeem miles for travel! We got 4,250 miles just from doing this redemption, meaning our account balance now is worth over $50 if we play things right. It’s the gift that keeps on giving! This card really makes you want to keep coming back for more, which is something to watch out for! Once you redeem your miles on one purchase, you can’t double-dip and apply the 10% bonus you just received to it as well (I checked). So to use the remaining miles on our account we’ll have to make another travel purchase of at least $50, and when we redeem that we’ll get another 10% bonus… ad infinitum. Since we’re not interested in paying the annual fee on this card in its second year, we’ll either have to cancel or downgrade the card, possibly wasting some miles. But I’m not going to be obsessed enough with wringing all the miles we can out of this card to pay that annual fee. One last thing I’ll add in the way of a review… My Barclaycard World Arrival MasterCard number was stolen right around Christmas and a fraudulent charge was put on it. Not only did Barclaycard call and email me to let me know they caught the fraudulent charge, they were erasing it, and that a new card was being mailed to me – but they saw the fraudulent charge before we did! That’s pretty impressive to someone who checks Mint multiple times per day (ahem). When previous card numbers have been stolen, we have always seen the charges before the issuer caught them and have had to inform the issuer on most occasions. But this was really great customer service on Barclaycard’s part. To reiterate: There is no catch with the Barclaycard Arrival™ World MasterCard® – Earn 2x on All Purchases. Everything counts toward the minimum spend. You receive your huge sign-up bonus quickly. You just book your travel however you like and then within 90 days apply your miles and your balance will be reduced by the amount you redeem. Then you get more miles to use. It really worked how they said it would! If you 1) use credit cards and pay them off completely every single month, 2) are able to meet that $1,000 in 90 days minimum spend, and 3) expect to spend money on any kind of travel (flights, cruises, hotels, rental cars, travel agents) in the next year and haven’t yet signed up for this card, please ask yourself why! Give yourself the gift of $400+ worth of additional peace of mind on your next trip – or take an extra trip entirely! This sign-up bonus is one of the best out there at the moment so unless you’re actively churning another card it’s probably going to beat whatever long-term rewards are offered by your other cards over the short time period you’ll be using it. And yes, I would like you to use one of the links on this post to sign up because it will help me meet my goal of using blog income to pay for my trip to the financial bloggers conference in 2014. 🙂 But honestly, we’ve had such smooth experiences with this card that I have no qualms about recommending it to those who meet the above criteria. The highest compliment I can give it is the fact that we signed up for a second one. 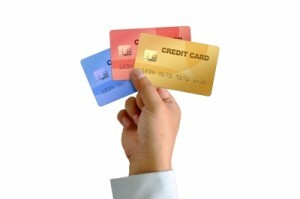 Do you prefer cash back or travel rewards cards? How would you decide to stop using the Barclaycard World Arrival MasterCard if the bonuses keep rolling in? What’s keeping you from giving yourself this bonus if you haven’t already? 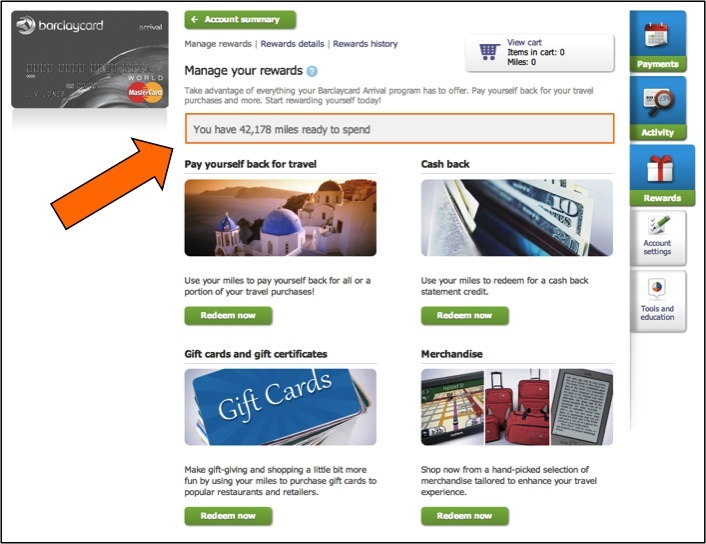 18 Responses to "Easy Travel Redemption with the Barclaycard World Arrival MasterCard"
Wow that’s an awesome card! I’ve always done cash back cards- but the travel ones are looking more and more tempting! Too funny about the 10% bonus forever– it’s a good attempt to rope people in and keep them as customers! Yeah, the travel cards are tempting but it’s rare we can find one that really fits our lifestyle. That’s why I’m so pleased with this one! I mean, the bonus is great if you love the card, but we will probably cancel it within the year. I made the decision that since I will have this card for a year, I’m going to use it to its optimal value. Since I have the Fidelity Amex that gives 2% cashback on anything and redeemable for everything, I’m not using the Barclaycard for everything, but I am using it for anything I would have otherwise used a 1% card for, so basically non-restaurant places that don’t take Amex. If I don’t end up redeeming the miles for travel purchases, I’m no worse off than before and if I do, I’m a bit better off. It also bugs me a bit that you have to redeem against travel purchases in increments of $25, but at least you can redeem the final cashback in full. That kind of detail about not being able to redeem twice against the same purchase is exactly why I wrote this post! I was curious about that myself. Do you consider that redemption a mistake just because you would accrue more miles on normal purchases through the almost-3 month period? That seems like a very reasonable plan! Do you think it’s negligible that you actually get 2.2% back on the Barclaycard, assuming you have eligible travel to redeem against later (and ignoring the $25 increments)? Yeah, I wasn’t too happy about the $25 increments either. I need to look into whether you can transfer all your points to the no-fee version of the card at the end of the year to keep them. I do think the extra 0.2% is negligible, mostly because it’s not guaranteed. But the Barclaycard is _likely_ to be better than a flat 1% card when that’s my next best option. It’s not guaranteed to be better though when I have a 2% option as my next best option. The only redeeming for travel purchases is a bit annoying considering that I don’t have them all the time and then the $25 increments makes it possibly not worth it, but reasonably possibly worth using over a 1% card. I agree that the flexibility of the Fidelity Amex is worth the possibly (if the stars align) higher rewards with the Barclaycard. I’d take the safer bet. If I wanted to apply and use the card for a single transaction travel purchase (about $1,500), how would that work exactly? Would I receive the sign-up bonus statement credit and then some? Sounds pretty great! It would be very straightforward, based on my reading the the fine print! If you make that one travel purchase (and it’s identifiable as travel by the card i.e. a flight, a cruise, a rental car, a travel agency, etc. ), you should very quickly receive the 40,000 mile bonus, plus the 3,000 miles for the $1,500 purchase itself. So once the transaction has gone through and you have all the points in place, you’ll be able to redeem $425 directly against the $1,500 statement. You’ll only pay $1,075! After your redemption, you’ll have 500 miles left in your account and then the 10% redemption bonus will give you another 4,250 miles. If you just use the card for another travel purchase of $125, you’ll have enough miles to redeem $50 against that statement balance and only pay $75 for it. If you don’t have a better option for long-term travel rewards this card is actually a good one at 2 miles for every $1 spent. looks pretty good. But would definitely be canceling within the first year to avoid the $89 annual fee. I agree. I can’t predict our travel well enough at this point to be sure that fee is worth it. Even if the numbers said it would be, I’m still ooked out by paying for a credit card so we won’t. We’re busy churning for some hotel nights now, and airfare will be up next. But if we don’t have enough time to get some United miles by our trip to Europe in July, then we may just end up trying the Barclay card to cover things like trains and whatnot. Thanks for the tip! I didn’t research this for myself but my friend who got the card told me there were no foreign transaction fees. I’d double-check that it would recognize trains and such in Europe would be recognized as travel purchases. As long as they are, that sounds great! Good luck with your current churn. Love the step-by-step here. I’ve never done a travel rewards card (just signed up for my first-the British Airways card) so I’d be a little nervous the first time to make sure that I did everything right and didn’t somehow lose my points or mess up the transaction. I’ve read a lot about this card and might sign up for one after I finish my first card. KK @ Student Debt Survivor recently posted..Parents, Don’t Co-Sign Student Loans! Thanks! I’ll have to look into other travel rewards cards sometime like the British airways one. We’re just so inconsistent with our travel and not brand-loyal.